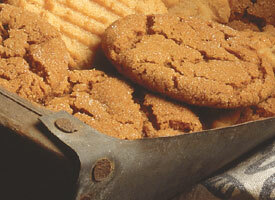 This recipe makes 6 dozen spicy molasses crinkles sprinkled with sugar. Beat together shortening, butter, and brown sugar in a large bowl with an electric mixer at medium-high speed until pale and fluffy, about 3 minutes in a stand mixer (preferably fitted with paddle attachment) or 6 minutes with a hand-held. Add egg and molasses, beating until combined. Reduce speed to low, then mix in flour mixture until combined. Put oven racks in upper and lower thirds of oven and preheat oven to 375F (190C) degrees. Roll 1 heaping teaspoon of dough into a 1-inch ball with wet hands, then dip 1 end of ball in sanding sugar. Make more cookies in same manner, arranging them, sugared side up, 2 inches apart on two ungreased baking sheets. Bake cookies, switching position of sheets halfway through baking, until undersides are golden brown, 10 to 12 minutes total, then cool on sheets 1 minute. Transfer to racks to cool completely.